Are you frustrated with your current living situation? Do you feel that life could be better in many ways? Do you feel like your dreams are so far outside your reach that it is pointless to keep trying? Are you just going through the motions and living day to day without any expectations, passion or an idea where your life is going? I know exactly how you feel. I wrote this book to let you know that your dreams are so important that you should never give up, no matter how impossible they seem. I want you to know that there’s always hope. No matter how bad your current life situation is there’s always hope. Never give up on your dreams. 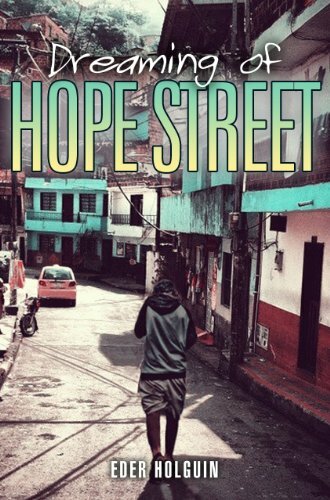 Dreaming of Hope Street is my personal journey, told in the classic Coming-of-Age tradition, and proves that, though life can be ugly and brutal, even the most disadvantaged can overcome the odds and find happiness, their own Hope Street. The narrative steps along and rings with authenticity; it’s often sad, shocking, but ultimately uplifting and motivational. Today, nearing forty, I am a successful New York entrepreneur in the online media industry. However, as a kid in the mid ’80s, I fled a frightening home life and wound up living for years on the streets of Medellin, Colombia. It was a dicey existence, in what was described during this era as the ‘most dangerous city in the world’, where international drug lords like Pablo Escobar ruled, where you could be shot for looking at the wrong guy the wrong way. The incredible journey from living under those circumstances to becoming a successful entrepreneur and CEO of a digital company; and how through effort, dedication and hard work I was able to get to where I am today is told in this book. Those life lessons and principles are universal and apply to everyone. I hope this book serves as a platform that will help you get to that next level; that, by reading it, you can realize that you too can achieve your dreams. My intention when writing this book was to provide you my story as a source of inspiration and to help you realize that you are the not a victim of your current circumstances, you have the power to create your own life. The choices you make and things you do today will determine your future. No matter how many times you have failed in the past, how many times you tried; just by changing your attitude and making different choices you too can change your life when you make the decision to do so, you too can become successful; achieve your dreams and live a happy life. To those who are victims of abuse and are currently living in fear, please find the help that you need. Open your eyes and realize that nobody deserves to be the victim of physical or verbal abuse. You deserve to be happy. Value yourself and love who you are, once you do this and discover your self worth; life will open up new opportunities and will bring new people into your life.